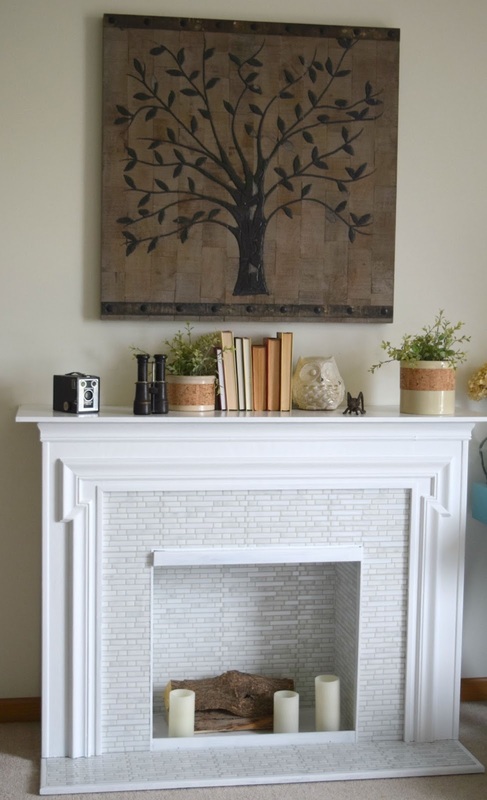 I am going to start this post by saying that I am blown away by how this fireplace turned out! I am almost always proud of my work, but this fireplace redo surprised even me with how beautiful it turned out. I was excited to take part in a blogging challenge called the 30 day flip. 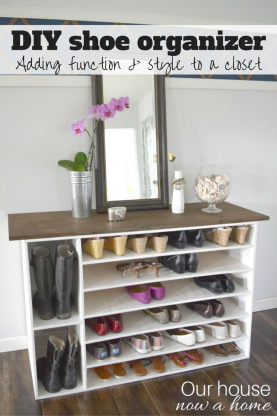 We have 30 days to flip something, and this months theme was secondhand store find. Now, I have a ton of secondhand store furniture in my home. But, I had this fireplace in our bedroom that had not been touched since purchased two years ago. This is an electric fireplace, that I will note and reiterate will never be used. The supplies I used for this are not safe for anything that will get hot. 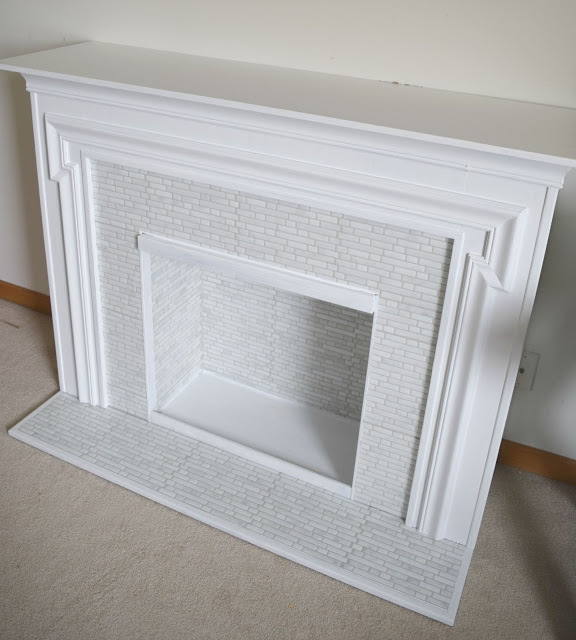 So if you are going to replicate this, be sure it is on a fireplace that is just for show. We have our big, massive and perfectly real wood burning fireplace in the living room. This was purchased to add some visual to a pretty sparse bedroom. I initially liked the black, but as we are redoing the rest of our room the black does not mesh with everything else. I needed to brighten it up! Make it shine, shine bright like a diamond! 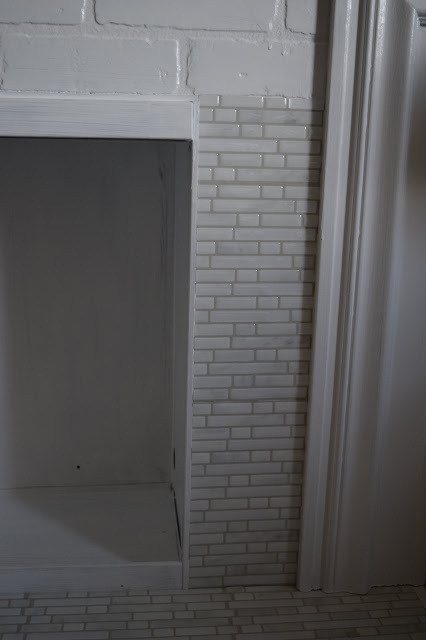 This is the faux brick finish for the fireplace. 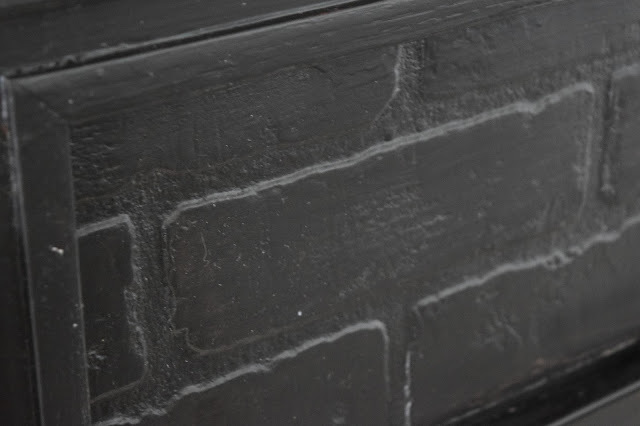 It is actually a smooth surface, just appears to have texture to it. To begin, normally I would have recommended sanding this down. 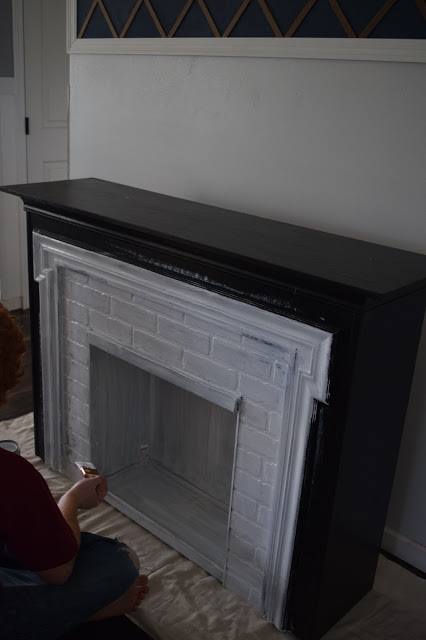 However, there is a ton of small details in the fireplace, and sanding it proved to be very difficult. So instead I purchased primer, put on two thick coats of it before painting it. This also was needed to cover up all of the black paint. The details are already popping with just the primer going on! The above picture is with one coat of primer and the picture below is with two coats of primer. This is where the movie magic comes in, also the fact that I was doing this project with three kids running around with pretty frequent interruptions. I forgot to take pictures of the painting process. 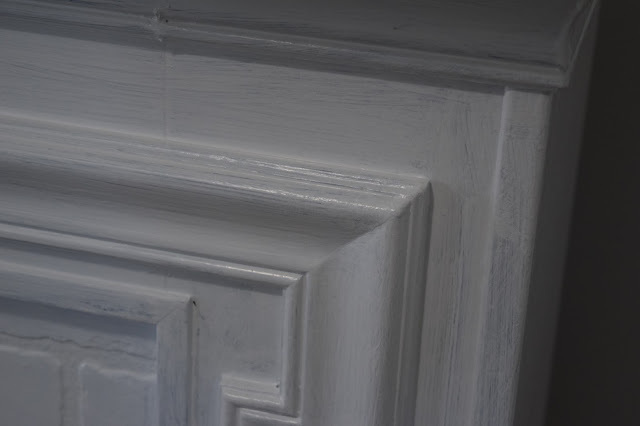 I painted on two coats of a semi-gloss bright white paint. 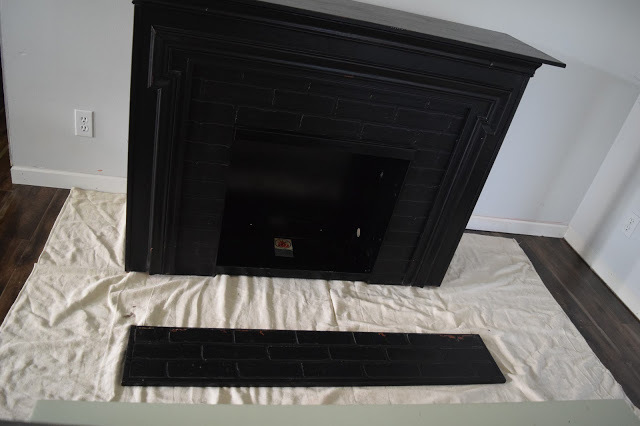 Again, this is to cover up the black paint and to help long term coverage of the fireplace itself. I wish my kid’s could just respectfully understand that Mommy is busy redoing things and being all “bloggy” and they need to give me some space. The fact that one sock is stuck or their elbow itches is not important to me! 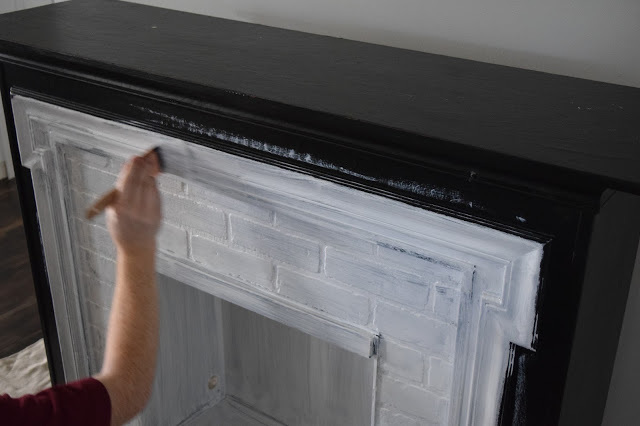 Must paint this fireplace! Here is where what I do is awesome. Blogging being the thing that is awesome, not dealing with a child’s itchy elbow. That is just weird and awkward for all involved. 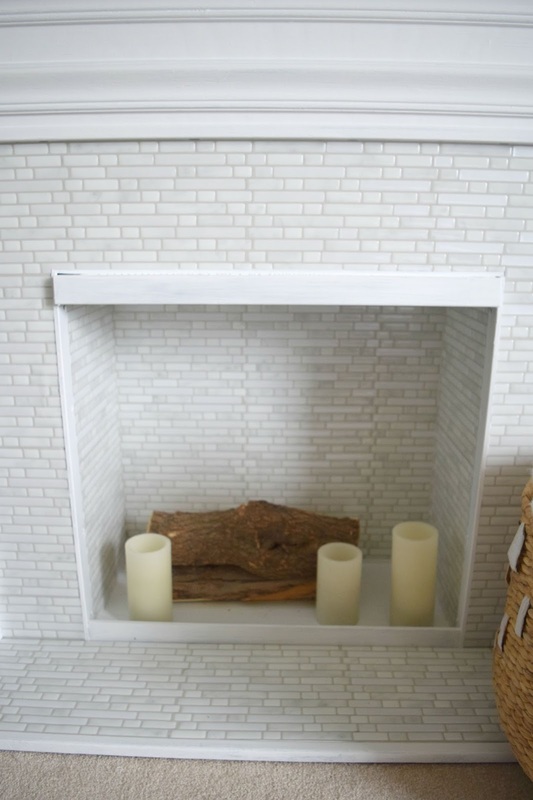 I debated a great deal about how to tile this fireplace. Initially I planned to go the legit tile and grout way. The concern of the weight of the tile on this came into play. This is a particle board, glued together fireplace. I did not make it, but the lack of support and strength in this is obvious. It is solid to sit and look pretty. To hold a bunch of heavy tile might be a stretch for this. I did not want to add support or rebuild this fireplace. If I was going to do all of that I might as well just build a brand new one. 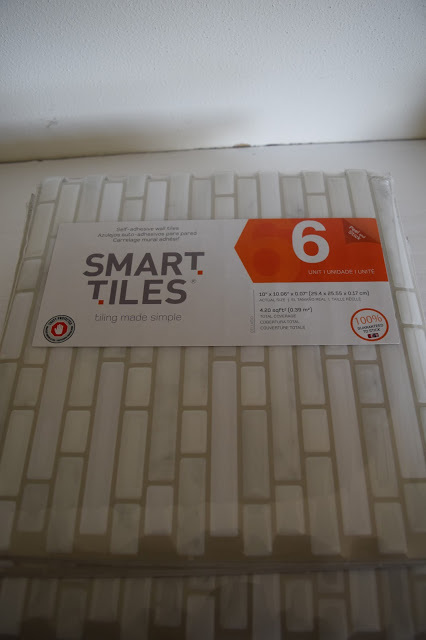 One of my blogging friends recommended Smart Tiles. 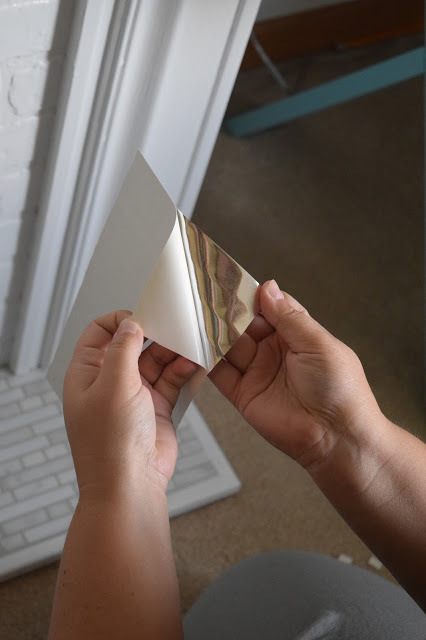 They are a peel and stick tile, and pretty dang amazing! I was not familiar with them and found out that they are in most Home Depot stores. I headed over to check them out. I wanted to make sure that they did not look like wall paper with some texture. I was so excited when I saw them in the store, they had a lot of options, colors, and textures. They also looked and felt very much like a tile surface. However, the store did not have what I was hoping for. So I went to their website. You can go here to their site. This is the part where I love my job, I reached out to smart tiles to see if we could work on a campaign together. Crazily enough, they agreed! 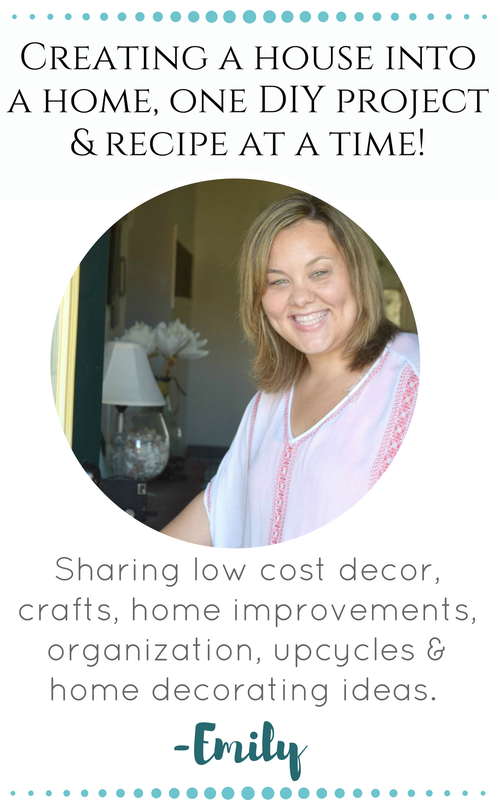 For those of you who are not privy to how home decor blogs and brands work together, let me explain. It is pretty much a match made in heaven. They need people to find out about their product, get honest opinions, pretty pictures of their product in real life. 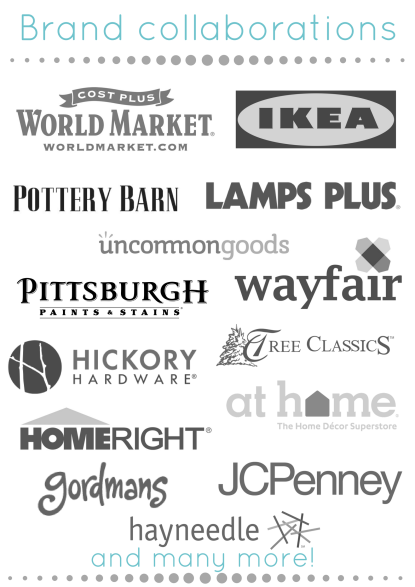 While us bloggers get to work with great brands, make connections, and get to do more projects because these amazing companies will (at times) give us product for free. This allows me to do more projects, because at the rate of projects I create it can get expensive. Anyways, once I spoke to their representative and selected my tile I waited very impatiently for it to get to my home. I was like one of my dog’s. Ears perked up and running to the window any time a big truck drove by. Whining and drooling may have happened too. They finally came! They came in little packages of 6. They are 10×10 sized little squares. Really light, I would say only a little heavier than a piece of paper. Perfect for my job. Before you start using the smart tiles make sure the surface is clean, wiped down, and flat. Because my faux brick was actually flat I was ok. To begin I used a razor to cut one end of the tile flat. This allows the edge to be flush to the side of the fireplace. To have them meet together the other side needs to be cut as well. The extra grout side needs to be shaped in the same way, to have the edges interlock. I did this by using two tiles. Using a razor and running it along the already cut piece. I set the non cut piece on the bottom and the ready for interlocking piece on top. Running the razor along the cut edge. Then pull any remaining pieces away to have a perfect cut. The other option to achieve this look is to not cut the edges at all. Just be sure to lay the interlocking edge up against the non-cut edge. Making the appearance of a interlocking tile. Either way can work perfectly fine and is up to your preference and what you are comfortable with. Then, are you ready for the crazy simple way of using these? This is so easy, not the blogger “easy” where I show you 10,000 cuts, with really complicated tools all with my hair done pretty and full makeup on. This is legit, simple, anyone can do it. Peel the backing paper off after you have your desired piece. Before peeling, I set the piece on the fireplace and made cut marks where I wanted it to go. 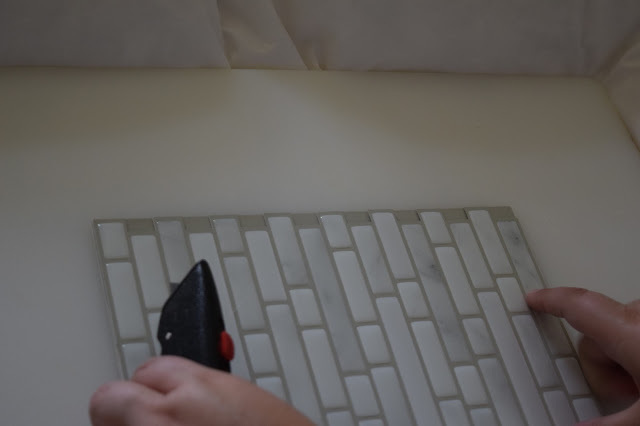 Then using scissors cutting the tile into my needed size. This is the back of the tile, this side is the sticky side. Peel and then stick. Push down, smooth out. You can take it off and readjust if needed. Sometimes I set it on and there was a air bubble. I got rid of it by re sticking it and smoothing from side to side going up. The stick of the tile does become permanent but there is some wiggle room for… wiggling. Tada! The one trick here is that when laying two pieces of interlocking tile together have the “grout” lines overlap. If you do not do this the “grout” lines will appear larger. Making them blend into one piece is what looks best. So, lay the grout on top of each other to keep the grout size the same all around. This is the only real tip and thing you have to pay attention to. This took my breath away as I was working on it. I became a really needy child here and wanted to get it done. I had zero patience for anything but seeing the completed project. The process of tiling took about two hours from start to finish. Not bad at all. If I had tiled it the standard way this would have been a all weekend project. We are not virgin tilers, we have been around the block. But this would have still taken a while. This was a no mess way of tiling and I love it! 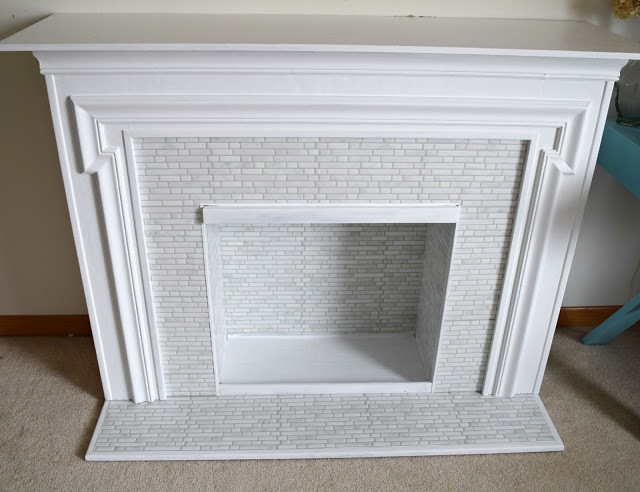 The details of this fireplace popped so much with the white paint. 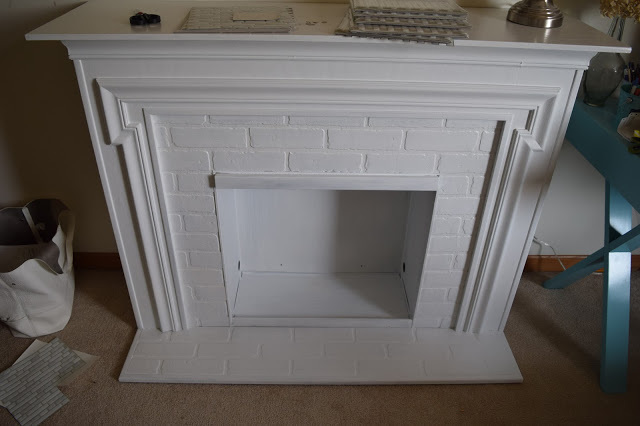 It does not even look like the same fireplace. Time to style this up! I adore a nicely done fireplace and seating area. Our bedroom is going over a big time overhaul so I cannot show you wide shots. It involved laundry, a dirty and paper cluttered desk, a half-painted shelf, and half painted walls. I was so eager to get this out before the room is done I could not wait. I grabbed some things from around our bedroom. A few books turned backwards. I did this because the spines of the books are all different colors. I wanted a clean and neutral color palette and the book pages are great for that. The contrast of the white fireplace and the dark details on that amazing tree of life wall art purchased from World Market are stunning to me. I like to have contrasting pops of color like that. The old fashioned camera’s and binoculars were Dale’s Grandpa George’s. I never got to meet him, but heard wonderful stories, Gavin’s middle name is George and many small trinkets of his are around our home. This home has so many stories and personal touches. No matter the style making it personal with the people in your life and the memories you have made is the best way to make a home. The firewood is real, and will not be used in this fireplace. I stole them from our real fireplace in the living room. I want to purchase some nice fake wood logs for here. I just could not find what I wanted. I want something dark to off set and warm up the fireplace. I adore the light and bright theme of the fireplace. But having some dark wood to ground and warm up the space will look really nice. 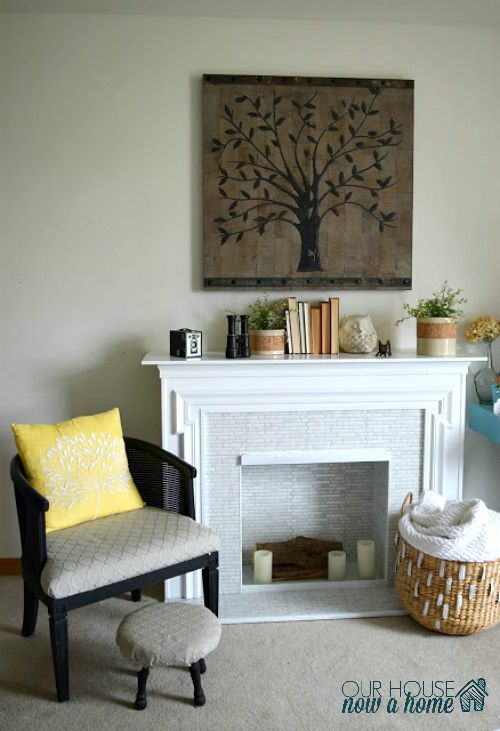 The tree picture is a great example of how a little bit of dark colors can help accentuate the light fireplace perfectly. Our room has no seating area, it is one big square box. 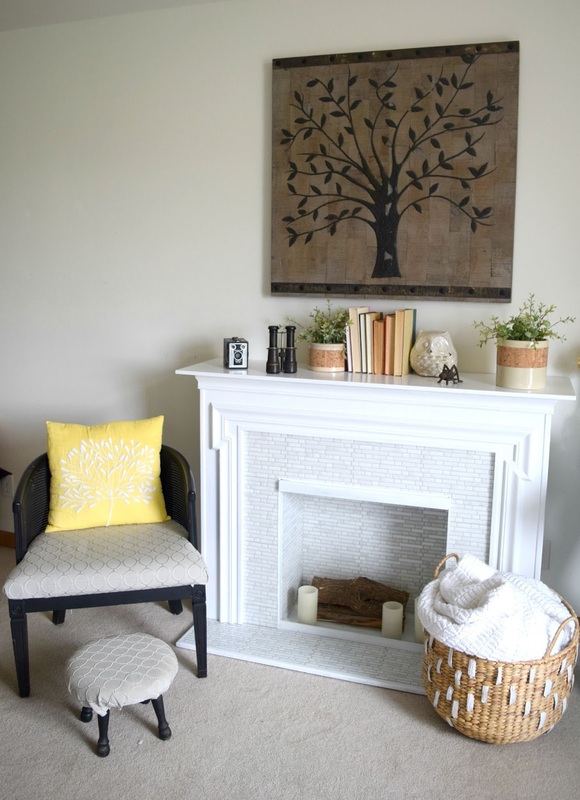 This fireplace defines a beautiful seating area. The wonderful wall art was purchased at World Market. It caught my eye for months in that store and I finally had to have it. I was a legit stalker and would visit the wall art when I went shopping there. The afghan was made by my really talented Aunt Sally and is the coziest thing ever to cover up with. The chair I redid and you can find the tutorial here. The little stool I redid and shared over at a website I contributed to, Fancy Shanty. You can see the tutorial here. This space is a mix of store bought, family pieces, secondhand treasures and upcycled furniture. I love this mix! Having this little seating area and fireplace done in my bedroom is making me so antsy to get the rest of my bedroom done. There is still so much work to be done, function to make, and pretty to bring out. I am not a very patient woman. Ever. Dale and I got engaged after 5 months of dating, we had three kids within three years. Our first came before our 1 year wedding anniversary. When I make a decision I am going to do something, I do it. Jump, run, plan, plan and plan, but I want to do it all now. I have turned my eye to our bedroom and am going full force. Well as full force as possible. Checking this off of the to-do list is amazing and so exciting. If you want to see any other 30 day flip people head over to any social media and search for the hashtag #30dayflip, you should see all of the people taking part in it with their amazing secondhand furniture flips. I am bringing in the sun, the light and bright colors in here. I had thought I would do a dark and more dramatic look in my bedroom. However our bedroom is also working as my home office, and where I do a lot of writing and creating. I needed a light and bright space to work during the day. Maybe if we move into a larger home I can make a dramatic bedroom. For now it is turning into a sunny and happy place for work and sleeping. 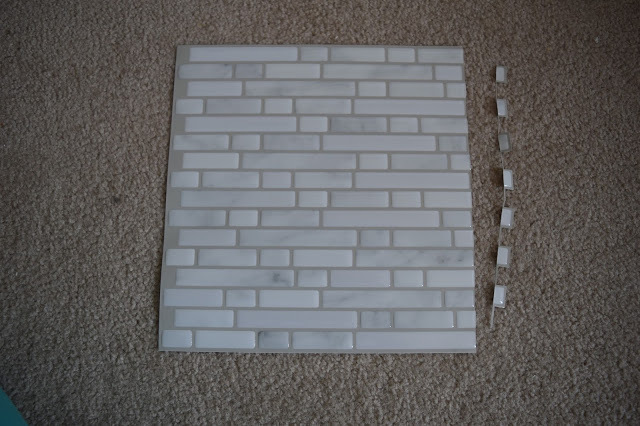 If you are ever looking for a project with tile but don’t have the budget for real tile or the skills for real tile. 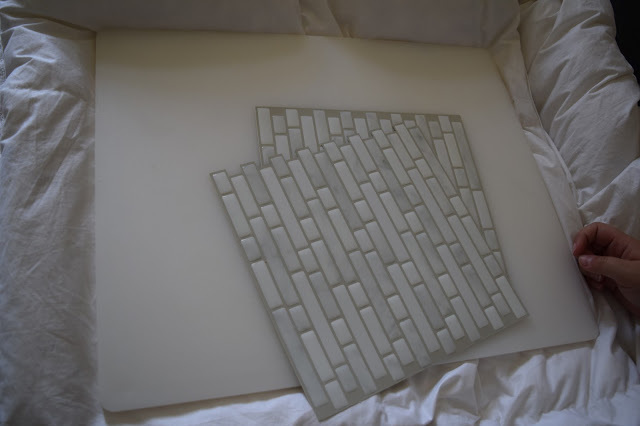 Smart tiles is a great option and one I wish I had known about when we were redoing our bathroom and kitchen. It would have saved us so much time! 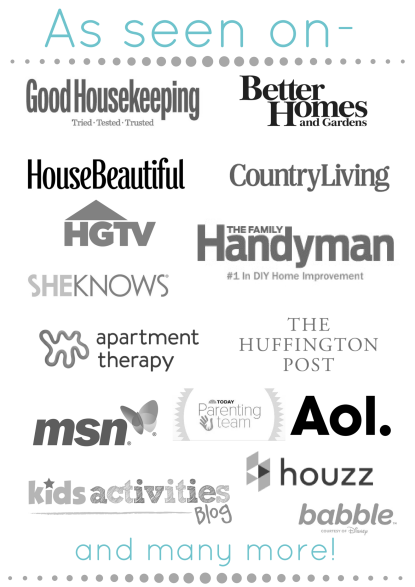 Have you ever taken part in the #30dayflip? Are you following along? Looks beautiful! You would never know that tile wasn't the real thing! Thank you! I was so impressed with the tile. In person it looks even better and authentic. You did a great job there – it looks totally gorgeous! Love all the candle decorations too! This turned out really well. I love the lighter look. 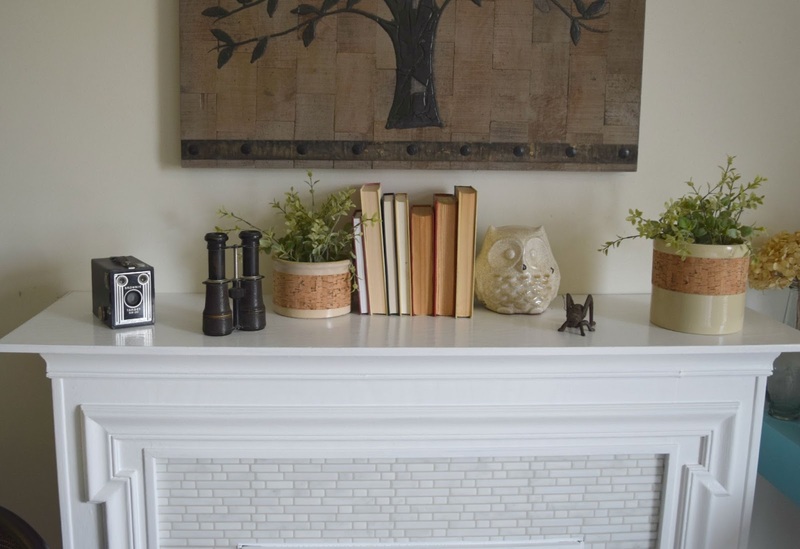 I also love the pretty mantel- especially the books! Thank you! I am loving the lighter look so much. It makes the space feel huge now. 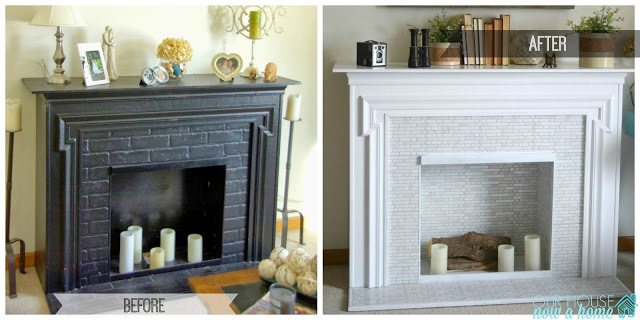 I agree, it doesn't look like the same fireplace at all! 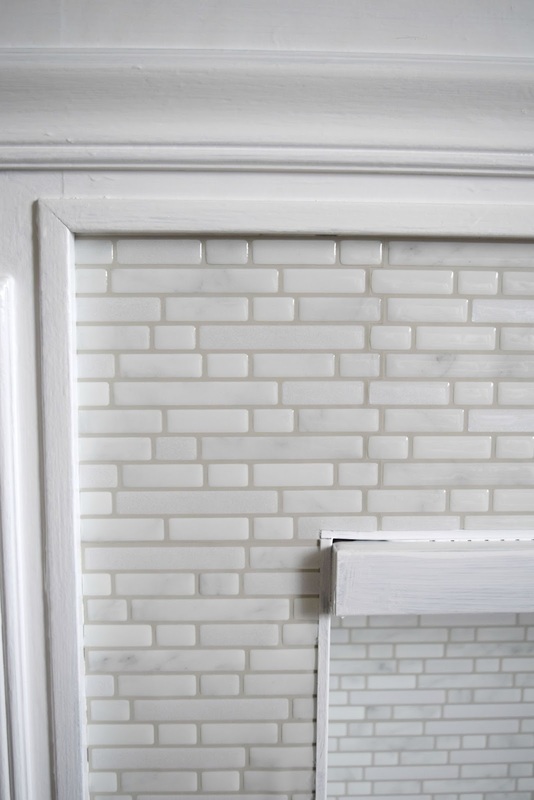 It's so gorgeous, I love the white and the new tile! That stuff is pretty cool, I'll have to check it out! Thank you! 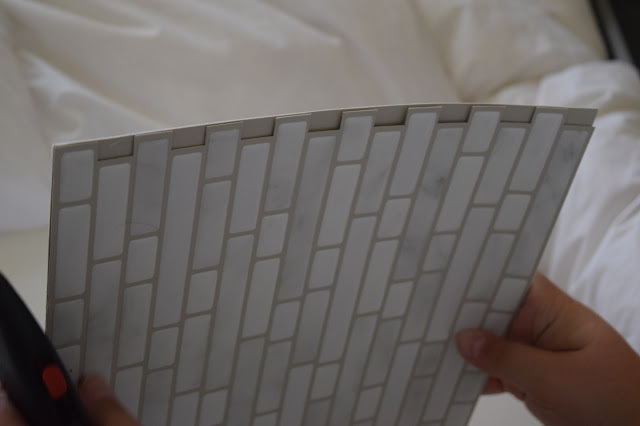 The smart tiles would be a dream product to use as a back splash, so easy to install. You did a great job! It is light and airy! Love that tile! This turned out gorgeous. Even though you'll never use it, it adds a nice cozy touch your bedroom. Thank you, the tile is amazing! My bedroom needed some kind of focal point and this fireplace adds just the little something it needs. I really like the smart tile! I didn't even know something like this existed. Now that the kids are in school I can actually craft again. Making something with those tiles is definetly on my list! I did not know either, and am so happy it was recommended to me from a friend. 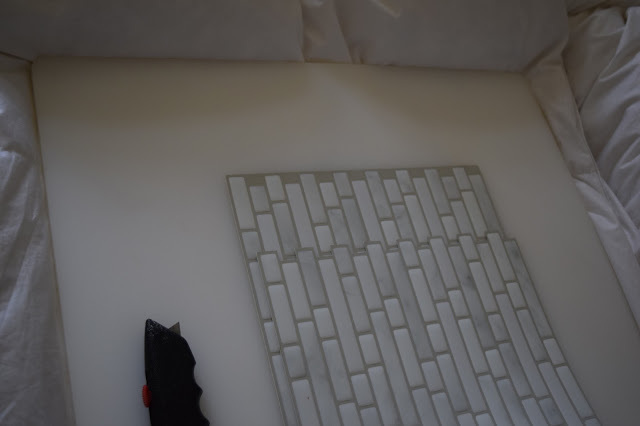 This tile was so easy to install, good luck with your smart tile project! Oh my goodness – I love the way this looks! You did it again, Emily! Thank you! This project was a fun one! WOW! That turned out to gorgeous, and those tiles look really easy to install. Great job! Thank you! The tiles were so simple, I wish I had known about them when I was putting in the back splash in our kitchen. Now I know. 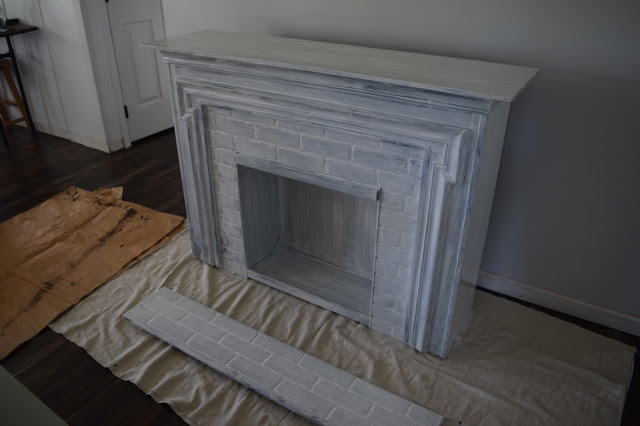 Wow Emily, your fireplace looks fantastic!!! I really like the white color and the tiles you chose. 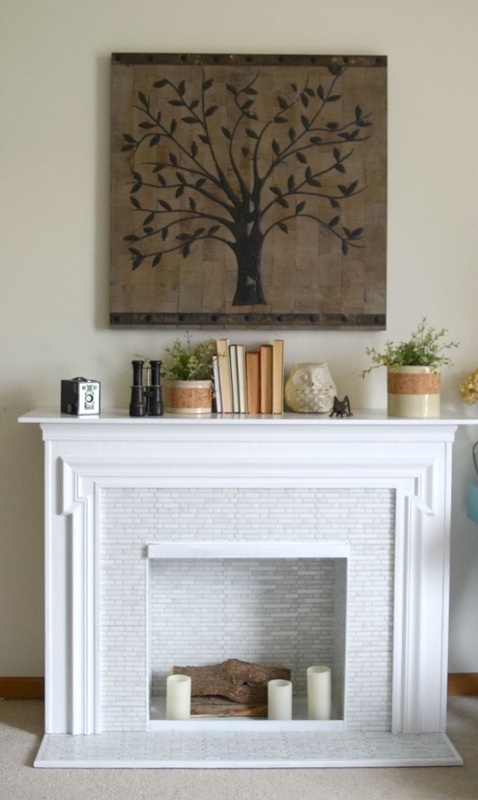 Gorgeous and such a great idea to redo an electric fireplace! Looks Fabulous! You always have some great projects going on. Glad it works better with your new color! Thank you so much! 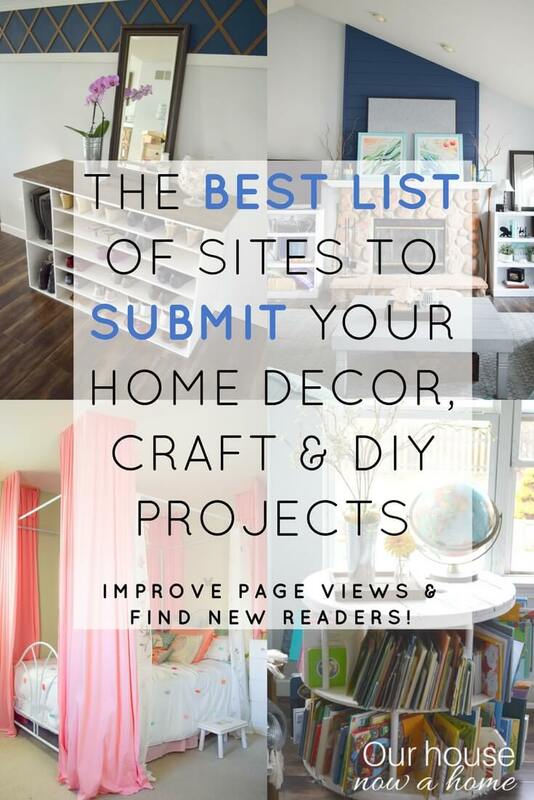 I am glad to know you enjoy my home decor projects. Wow! what a difference those tiles made. Your fireplace looks gorgeous. Pinned. The tile looks great. 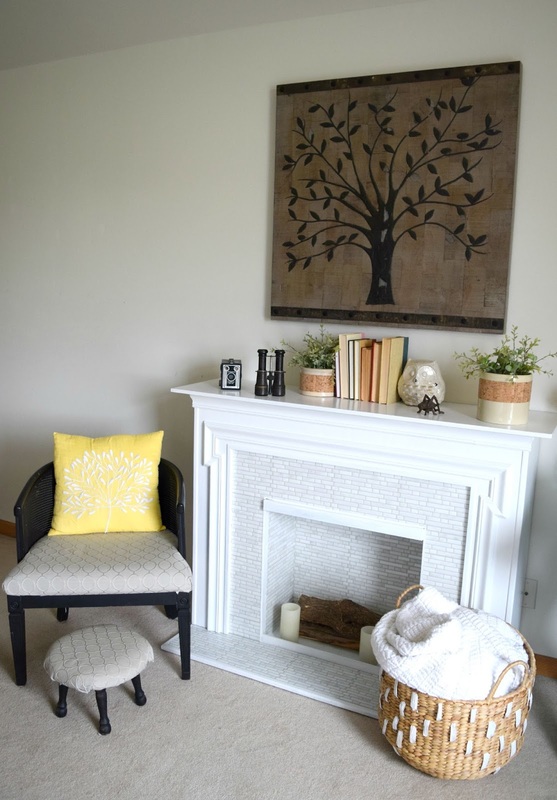 I especially like the dark tree picture and the yellow pillow. I don't like too much white or white, and that makes it perfect! Once again, you are amazing. Thank you so much! I needed something dark to contrast all of the light colors going on. That picture I purchased from World Market. Your work is so beautiful. And thank you for making the steps so easy to follow. Thank you so much! I am glad the steps were easy to follow along with. The whole project turned out great but I'm especially impressed with the Smart Tiles. My head is swimming with ideas of what I could possibly do with those things. Thanks so much for sharing. Thank you! The smart tiles were crazy easy to do. The options are massive with what can be done. Have fun creating! This looks beautiful! What an amazing transformation! This is SO cool! I had no idea those even existed! Love how your fireplace turned out! Thank you! 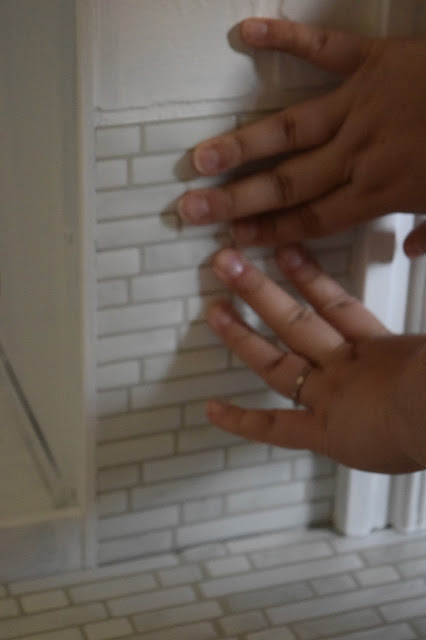 I am happy I introduced these tiles to so many people, it is such a great product. Wow, quite a project. i always wonder how people blog and DO all the the things they blog about! Just getting a chance to read through this post. This came out amazing, Emily! 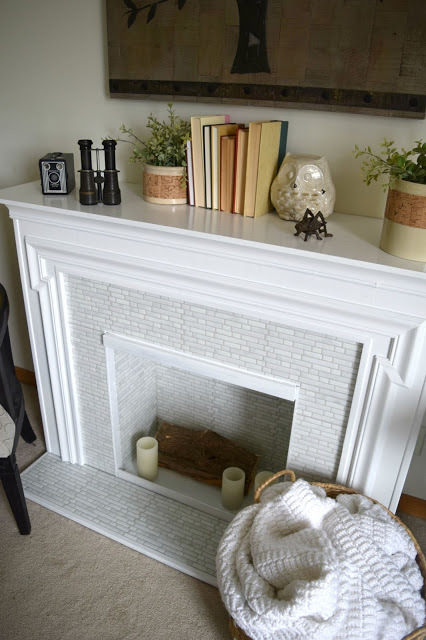 I bet you love staring at this "new" fireplace. Great job! Thank you so much Theresa! I do love this new sitting area now. 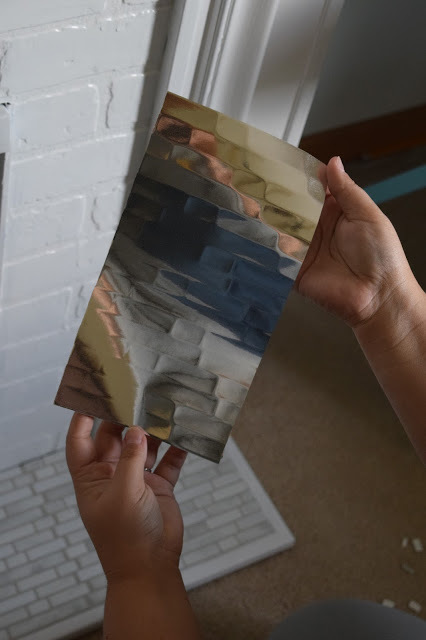 Do you know what the color of that smart tile is? 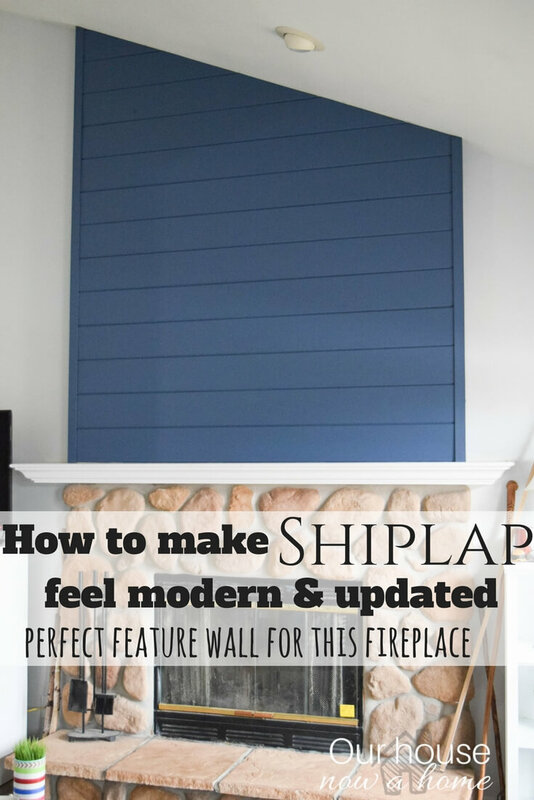 I would love to do the same thing to my fireplace! It looks beautiful. Great Job! How did you hang your Tree of Life? It didn’t have anything to hang it with on the back and was wondering what would be best to hang it with.